Tutors were puzzled, as places on the business programme were fought over, whereas my new course seemed to come free with a packet of cereal. Instead of being surrounded by ambitious young peers I found myself in the company of Liverpudlian ex-dockers and early retirees. While they wished to understand the loss of livelihood, and I was in brattish search of identity, we shared something powerful. We were entranced by the dance between the economic and social throughout the era of modern industrialisation. One of the aspects that most intrigued me was the rise of public services through the formation of large, mostly publicly owned bodies to govern areas like health, social care and education. This growth took place mostly within a context of industrial growth and it embodied at least two key principles. First, that public services are run by professionals (an expert model). Second, that there is a clear distinction between the providers and recipients of services (a service delivery paradigm). Both of these resonated well with industrial forms of organisation, which tend to favour clarity and hierarchy of structure. Undoubtedly, public services did much to improve the health, wellbeing and intelligence of nations, in turn contributing to further economic growth. However, this system was coming under increasing pressure, which became visible to me one day in my final year at university. Cycling to lectures one day I saw an older man sitting on a bench in a graveyard above the Mersey, surveying a vast tract of the river. There was something compelling about this scene so I wheeled my bike over to ask him, “What are you looking at?” He replied “The ghosts of great boats, the silence of empty shipyards and the end of life as I knew it’. He was framing, in a personal way, the major shift underway as the world started its pivot from industry and manufacturing to technology and information. While it was some years before computers, heralding the next age, appeared routinely on desktops, the pace of change was accelerating. A new context emerged rapidly as we have transited from the industrial to the technological revolution. In its turn, this has started to spawn new principles of economic and social engagement that have challenged the principles underlying public services. Public services, in keeping with large bureaucratic structures preserved by well-educated experts, have been slow or perhaps reluctant to embrace the emerging reality that, in their current form, they cannot scale up to meet the nature nor level of demand while keeping quality consistent. The statistics speak volumes and perhaps demonstrate that, after all, the industrial era was better at delivering asset accumulation than equality of opportunity and access. For example, at least three in every four people experiencing poor mental health in the UK have no support or treatment; 65% of jobs for which we educate our children do not yet exist; and two thirds of the world’s population does not have meaningful access to the rule of law. In a bid for self-preservation, public services have tended to respond either with highly structured interventions that emphasise quantity over quality, or operate as safety nets rather than supporters of individual wellbeing and growth. It appears time to frame a new question. Instead of asking how we provide more for less, we need to ask how we do things differently and better. We need to embrace not just how technology has transformed how we conduct our daily lives in banking, shopping and entertainment, but how it can have a similar impact in health, education, social care and the law. We have entered a new Age of Enlightenment, but we need to take off the blinkers that hold us to a context and principles that have historical relevance but little contemporary applicability. To do this we need to change how we understand public services and to make a shift from expert models based on delivery to social models based on engagement. The dominance of the “expert model” rarely leads to the transfer of meaningful learning. Also, it entrenches the ability to attach monetary value to those who hold the expertise. Lawyers provide defence, doctors offer treatment and teachers deliver education. In most cases, the public remain passive recipients and not informed actors. Further, they pay for assets they believe they can never possess. In the private sector, technology has changed these premises. It has offered new paradigms for gathering expertise through crowdsourcing and machine learning. It has enabled personalised responses through data analytics and algorithms. It has stimulated individual training, for example, to enter the market as a producer and consumer through direct and open retail platforms. And it has redefined the nature of assets. In tech companies, we can see the rise of business models that more closely integrate economic and social purpose whilst shifting the role of customer to co-producer. A new meta-trend is emergent that reduces barriers to entry into direct trade whilst integrating social engagement and impact as mainstream activity rather than “corporate responsibility”. Indeed, work by the World Economic Forum suggests that companies that integrate social purpose, rather than embrace social responsibility, perform more strongly financially. A new breed of business, from Uber to Amazon, share a set of characteristics that shift the paradigm in how business has been conducted historically. Yet they are not just applicable to business. In some respects, they have even greater resonance for how we transform public services. Let me select just four characteristics of digital models that have and can be widely applied to areas such as health, education, social care and the law. Co-creation of the service where the product/service is built through a continuous dialogue between those who “use” and those who “build”, resulting in social design rather than service delivery. This formed the basis for my organisation Big White Wall (BWW), a facilitated community for those experiencing poor mental health, using design principles including accompaniment (peer community), location (quantified self tracking of emotional/mental state) and resilience (tools for learning self-management). Similarly, I have recently set up a new company that is co-designing ‘amo’, an app for teenage wellbeing, with thousands of young people. A shift from the expert to the social model where we are recognized as the experts in our own lives who may use data to discern patterns and develop algorithms that personalize experiences to us. Look, for example, at CrowdMed, where people with unresolved health problems collaborate with “medical detectives” to get a diagnosis. Similarly, I no longer need to visit a doctor for a blood test or to measure my glucose levels. The promotion of social engagement and informed decision making through commentary, social media, ratings and recommendations. This is one area where public services have begun to dabble with online educational resources, the use of peer communities for support/learning and the public ratings of health services and professionals. Transparent and direct transactions between producers and consumers and the decline of the “middleman” in transactions. For example, as learning goes increasingly digital, we see the advent of virtual classrooms and even classes without teachers. Similarly, I have initiated a project with IBM, ‘outlaw’, an app that hopes to provide a direct connection between the law and the person enabling individual to get personalized first line legal advice without recourse to a solicitor. Achieving any kind of significant change requires courage to “decommission” products and services that are past their “use by date”, as well as incentives to stimulate creativity in engaging people directly in responsibility for their own health, wellbeing and learning. To avoid being hijacked by politics, I would urge that this is not a call for the end to the “nanny state” - a British metaphor for overbearing government - but rather a proposal to use technologies that empower us to have agency in our own lives. I believe it time to stop waiting for others to deliver services to us, and to step into being experts of our own selves who are engaged deeply in optimising our own health, learning and wellbeing. 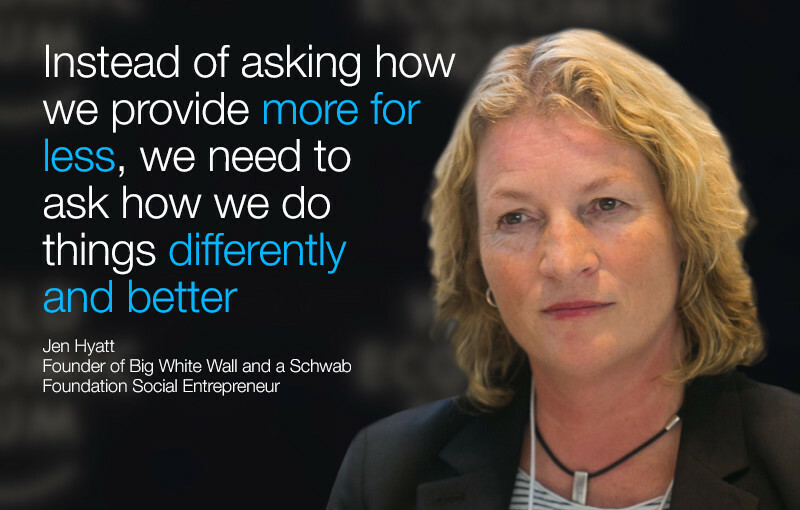 Author: Jen Hyatt is the founder of Big White Wall and a Schwab Foundation Social Entrepreneur. She has founded or helped establish more than 30 social impact organisations in more than 20 countries. She is participating in the World Economic Forum’s Annual Meeting in Davos.